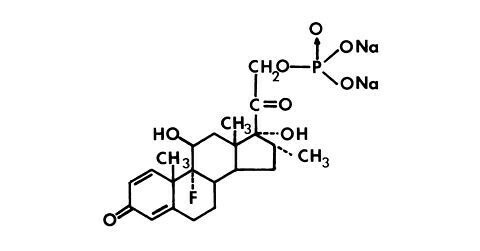 Dexamethasone sodium phosphate, a synthetic adrenocortical steroid, is a white or slightly yellow crystalline powder. It is freely soluble in water and is exceedingly hygroscopic. The molecular weight is 516.41. It is designated chemically as 9-fluoro-11β,17-dihydroxy-16α-methyl-21-(phosphonooxy)pregna-1,4-diene-3, 20-dione disodium salt. 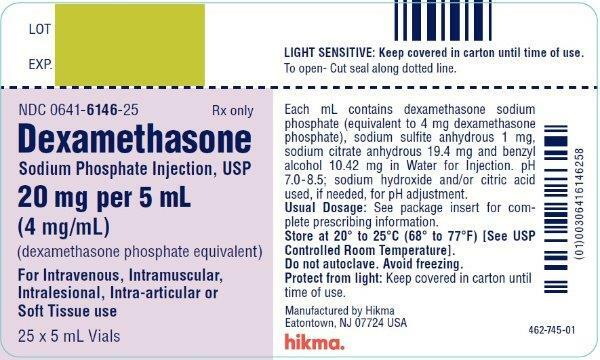 Dexamethasone Sodium Phosphate Injection is a sterile solution of dexamethasone sodium phosphate for intravenous and intramuscular use. The 4 mg/mL strength may also be used for intra-articular, intralesional and soft tissue administration. 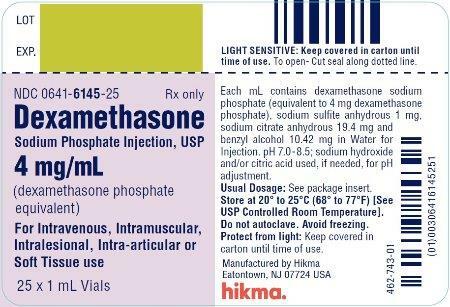 Each mL of Dexamethasone Sodium Phosphate Injection 4 mg/mL contains dexamethasone sodium phosphate, equivalent to 4 mg dexamethasone phosphate or 3.33 mg dexamethasone. Inactive ingredients per mL: 1 mg sodium sulfite anhydrous, 19.4 mg sodium citrate anhydrous and 10.42 mg (0.01 mL) benzyl alcohol (preservative) in Water for Injection. 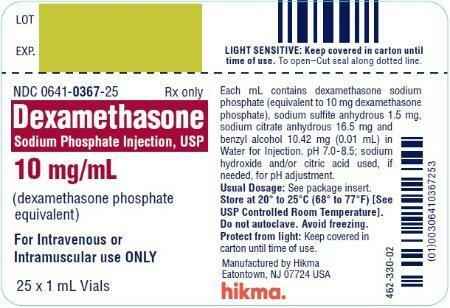 Each mL of Dexamethasone Sodium Phosphate Injection 10 mg/mL contains dexamethasone sodium phosphate, equivalent to 10 mg dexamethasone phosphate or 8.33 mg dexamethasone. Inactive ingredients per mL: 1.5 mg sodium sulfite anhydrous, 16.5 mg sodium citrate anhydrous and 10.42 mg (0.01 mL) benzyl alcohol (preservative) in Water for Injection. The pH of both concentrations is 7.0-8.5; sodium hydroxide and/or citric acid used, if needed, for pH adjustment. Sealed under nitrogen. Similarly, corticosteroids should be used with great care in patients with known or suspected Strongyloides (threadworm) infestation. In such patients, corticosteroid­-induced immunosuppression may lead to Strongyloides hyperinfection and dissemination with widespread larval migration, often accompanied by severe enterocolitis and potentially fatal gram-negative septicemia. While on corticosteroid therapy patients should not be vaccinated against smallpox. Other immunization procedures should not be undertaken in patients who are on corticosteroids, especially in high doses, because of possible hazards of neurological complications and lack of antibody response. Steroids should be used with caution in nonspecific ulcerative colitis, if there is a probability of impending perforation, abscess, or other pyogenic infection, also in diverticulitis, fresh intestinal anastomoses, active or latent peptic ulcer, renal insufficiency, hypertension, osteoporosis, and myasthenia gravis. Although controlled clinical trials have shown corticosteroids to be effective in speeding the resolution of acute exacerbations of multiple sclerosis they do not show that they affect the ultimate outcome or natural history of the disease. The studies do show that relatively high doses of corticosteroids are necessary to demonstrate a significant effect. (See Dosage and Administration Section). A. Intravenous or intramuscular administration. The initial dosage of Dexamethasone Sodium Phosphate Injection may vary from 0.50 mg/day to 9.0 mg/day depending on the specific disease entity being treated. In situations of less severity, lower doses will generally suffice while in selected patients higher initial doses may be required. Usually the parenteral dosage ranges are one-third to one-half the oral dose given every 12 hours. However, in certain overwhelming, acute, life-threatening situations, administration of dosages exceeding the usual dosages may be justified and may be in multiples of the oral dosages. For the treatment of cerebral edema in adults an initial intravenous dose of 10 mg is recommended followed by 4 mg intramuscularly every six hours until maximum response has been noted. This regimen may be continued for several days postoperatively in patients requiring brain surgery. Oral dexamethasone, 1 to 3 mg t.i.d., should be given as soon as possible and dosage tapered off over a period of five to seven days. Nonoperative cases may require continuous therapy to remain free of symptoms of increased intracranial pressure. The smallest effective dose should be used in children, preferably orally. This may approximate 0.2 mg/kg/24 hours in divided doses. In treatment of acute exacerbations of multiple sclerosis daily doses of 200 mg of prednisolone for a week followed by 80 mg every other day or 4–8 mg dexamethasone every other day for 1 month have been shown to be effective. After a favorable response is noted, the proper maintenance dosage should be determined by decreasing the initial drug dosage in small decrements at appropriate time intervals until the lowest dosage which will maintain an adequate clinical response is reached. It should be kept in mind that constant monitoring is needed in regard to drug dosage. Included in the situations which may make dosage adjustments necessary are changes in clinical status secondary to remissions or exacerbations in the disease process, the patient’s individual drug responsiveness and the effect of patient exposure to stressful situations not directly related to the disease entity under treatment. In this latter situation it may be necessary to increase the dosage of dexamethasone sodium phosphate injection, USP for a period of time consistent with the patient’s condition. If after a long-term therapy the drug is to be stopped, it is recommended that it be withdrawn gradually rather than abruptly. B. Intra-articular, soft tissue or intralesional administration. The dose for instrasynovial administration is usually 2 to 4 mg for large joints and 0.8 to 1 mg for small joints. For soft tissue and bursal injections a dose of 2 to 4 mg is recommended. Ganglia require a dose of 1 to 2 mg. A dose of 0.4 to 1 mg is used for injection into tendon sheaths. Injection into intervertebral joints should not be attempted at any time and hip joint injection cannot be recommended as an office procedure. Protect from light: Keep covered in carton until time of use. Store at 20°-25°C (68°-77°F), excursions permitted to 15°-30°C (59°-86°F) [See USP Controlled Room Temperature]. Avoid freezing. Do not use if solution is hazy or has a precipitate. Do not autoclave.